Yay! I’m super psyched, because after several months, I’ve finished my new book, and I’m really excited to see what people think! I’ve used my kids as a test audience, and they seem to dig it, but that’s a little bit like mom putting your picture on the fridge. Gamescape is all about a group of wandering monsters–Ratchette the goblin, Grimble the skeleton, Ochre the ooze, and Bartleby the giant bat–given a home by the mysterious Riddle Wizard, down in the labyrinth of his magical Gamescape. They travel into the world above when adventure calls, and discover puzzles, riddles, and games along the way. I wanted to tell a story that had those kinds of goodies sprinkled throughout for the reader to enjoy, too, so you’ll find several mind-benders in the book! 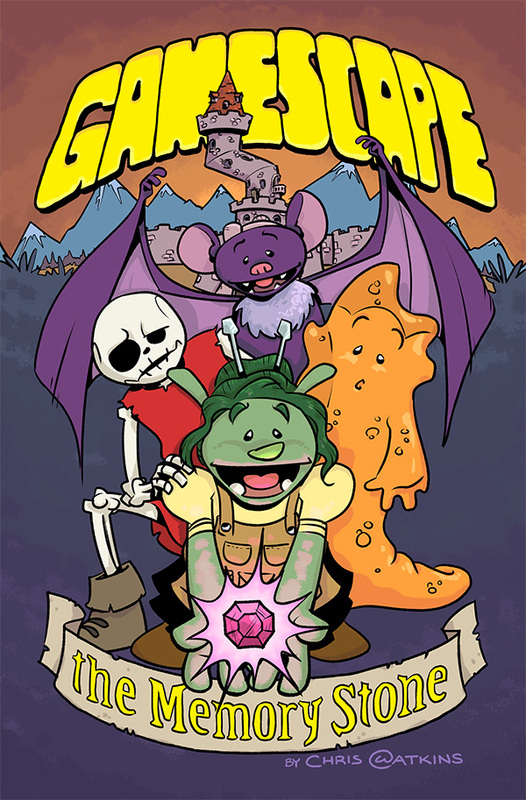 I’m debuting Gamescape at the Portland Comic Expo (that’s in Portland, Maine, not Oregon; sorry, west-coast friends) this Sunday, October 23rd. The show runs from 10 to 5, and I think admission is $5 (cheep!) I’m at table 58, which looks like it’s way on the far side, so bring your hiking stick and come to see me! And on an only tenuously-related note: I’ve seen my friends enjoying another Inktober, sharing cool sketches they’re doing every day, and I’ve been hankering to try. Now that my book is done, I’m going to give it a shot with what I’m calling A Monstrous Alphabet. I’m drawing some of my favorite creeps from across time, one for every letter. To be honest with myself, I may not make it all the way to Z, but it’ll be fun trying I’ll post a new one of these as often as I can this month, so please stop by again!